Toolroom - Thomson Lamination Company, Inc.
A group of highly skilled and experienced toolmakers and machinists operate the TLC Toolroom. TLC conducts an in-house apprentice training program which ensures the continuous availability of qualified personnel. 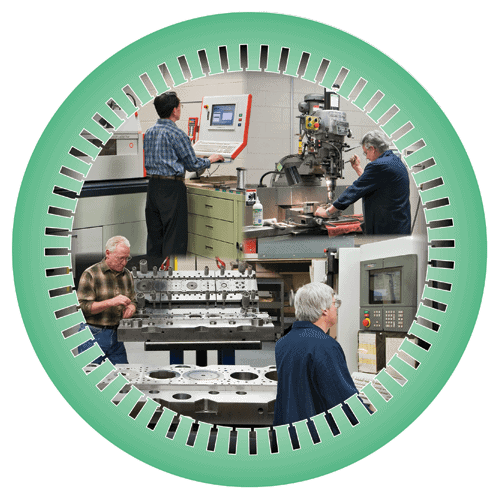 All of our machinists are cross trained to be proficient on all equipment. 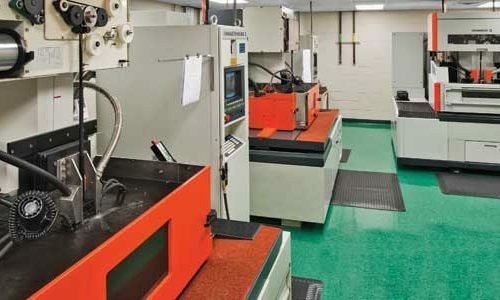 The Toolroom is equipped with state-of-the-art, precision equipment including surface grinders, jig grinders, CNC lathes, CNC machining centers and wire EDM. Our CNC lathe and vertical machining centers have machining capabilities of 30” x 60” x 30” travel. The machines are equipped with glass scales to ensure critical positioning accuracy and heavy-duty spindles and motors for strength and reliability. The Toolroom manufactures all types of tooling: progressive, insert, notching as well as wire EDM and laser cut laminations. TLC offers three design options for different production requirements. While the objective is to provide designs that offer the most economical opportunities for the anticipated production requirements, all options result in precision parts. 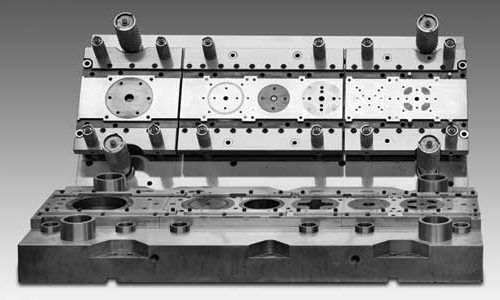 Short run and prototype requirements can be produced by notch tooling, wire EDM or laser cut. The tooling cost is low but the piece part price is significantly higher. Intermediate tooling for quantities of up to five million can be designed using TLC’s proprietary extensive Master Die Insert Program, which offers all the advantages of a full production tool but at a much lower cost. For higher production requirements, Carbide Progressive Tooling is available with guarantees to 100 million parts. All measuring equipment is checked, calibrated and laboratory tested in accordance with the National Institute of Standards and Testing and in compliance with the latest revision of AS 9100, ISO 9001-2015 and European Standard EN 9100. All other critical test equipment, comparators, surface plates & jig grinders are under contract to be maintained in accordance with the manufacturer’s original specifications. The Toolroom is responsible for the maintenance and repair of all production tooling, both TLC and customer owned. TLC will maintain all customer tooling at no charge for the guaranteed life of the tooling.